The Professional Squash Association (PSA) have today announced a groundbreaking, long-term partnership with the major multiplatform sports destination Eurosport that will transform the sport’s visibility and profile across Europe. 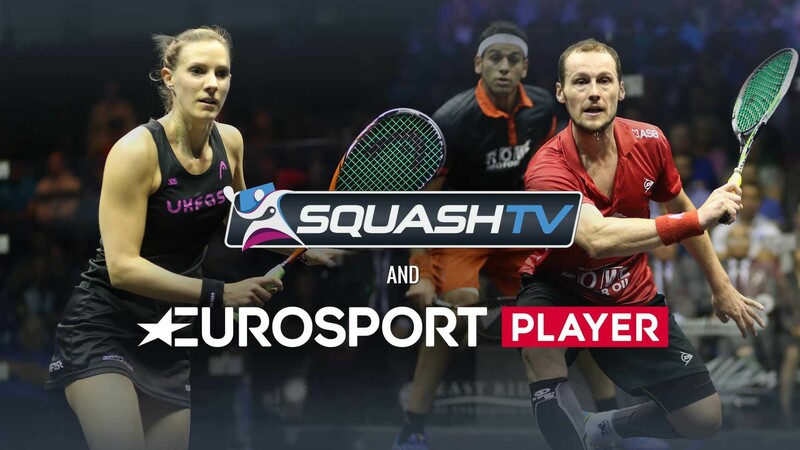 Under the five-year agreement Eurosport will become the new home of SQUASHTV in Europe, through their online on-demand channel Eurosport Player, and show close to 500 hours of world class squash action on the OTT platform per year. Beginning January 1st, 2016 all SQUASHTV tournaments will be shown live and exclusively in their entirety throughout Europe via Eurosport Player while selected highlights from major tournaments such as the British Open, U.S. Open, PSA World Series Finals and PSA World Championship will be broadcast throughout Europe via the network’s mainstream linear channels. “We are delighted to have reached an agreement with Eurosport and feel certain that this is the beginning of a partnership that will be of huge benefit to squash not just in Europe but all around the world,” said PSA Chief Executive Alex Gough. “Since taking responsibility for TV rights ‘in-house’ in January our global television reach has more than doubled as we have added major networks such as beIN Sport, BT Sport, Super Sports, Ten Sports, Tennis Channel and more to our portfolio and Eurosport is the latest top class network to join this growing list and the agreement will take our product and the exploits of our players into millions of new homes and expose the sport to an entirely new audience across Europe in what is a massive moment in the history of squash broadcasting. Peter Hutton, Chief Executive Officer, Eurosport said: “This deal with the PSA is a step forward in our ambition to be the leading sports destination and a sign of our willingness to invest in content specifically for Eurosport Player. “Eurosport is committed to fuel fans’ passion everywhere by delivering the best sport’s experience all year round and Eurosport Player is the perfect platform to deliver on this commitment to squash fans across Europe. Existing SQUASHTV customers will receive complimentary access to Eurosport Player until the end of their current subscriptions. They will also be able to watch a range of top class sporting action live and on-demand across a range of devices including tennis Grand Slams, Tour de France, top football leagues, motorsports and much more.